Does someone fall into sin? Does his despair even urge him to suicide? Let him but invoke this life-giving name (Jesus)and his will to live will be at once renewed. The hardness of heart that is our common experience, the apathy bred of indolence, bitterness of mind, repugnance for the things of the spirit—have they ever failed to yield in presence of that saving name? The tears he barrier of our pride—how have they not burst sweeter abundance at the thought of Jesus’ name? And where is the man, who, terrified and trembling before impend­ing peril, has not been suddenly filled with courage and rid of fear by calling on the strength of that name? Where is the man who, tossed on the rolling seas of doubt, did not quickly find certitude by recourse to the clarity of Jesus’ name? Was ever a man so dis­couraged, so beaten down by afflictions, to whom the sound of this name did not bring new resolve? In short, for all the ills and dis­orders to which flesh is heir, this name is medicine. For proof we have no less than his own promise: “Call upon me in the day of trouble; I will deliver you, and you shall glorify me.”(Psalm 49: 15) Nothing so curbs the onset of anger, so allays the upsurge of pride. It cures the wound of envy, controls unbridled extravagance and quenches the flame of lust; it cools the thirst of covetousness and banishes the itch of unclean desire. For when I name Jesus I set before me a man who is meek and humble of heart,(Matthew 11: 29) kind, prudent, chaste, merciful, (Titus 1: 8) flawlessly upright and holy in the eyes of all; and this same man is the all-powerful God whose way of life heals me, whose support is my strength. All these re-echo for me at the hearing of Jesus’ name. Because he is man I strive to imitate him; because of his divine power I lean upon him. The examples of his human life I gather like medicinal herbs; with the aid of his power I blend them, and the result is a compound like no pharmacist can produce. 10 Finally, be strong in the Lord and in the strength of his might. “The power does not come from the believer but from an external source.”[i] The power is not as a pumped up football player, a great athlete or soldier in any army on earth, but in the One Who is the Lord God Sabaoth, literally, the Lord of the heavenly Armies who dispatched His beloved Son, an army of One, to quell the evil one and free us from Satan’s tyranny. This is not natural strength, but supernatural, from the Lord into our hearts, minds and souls by the Resurrection of Jesus Christ. His might is His resurrection, the defeat of sin and death: see Ephesians 1: 18-20. 11 Put on the whole armor Greek: panopliav, “… the suit of armor of a Roman foot soldier.” [ii] Paul at the time of the composition of Ephesians was in Rome and under arrest, awaiting trial, and Luke tells us that Paul was guarded by a soldier. 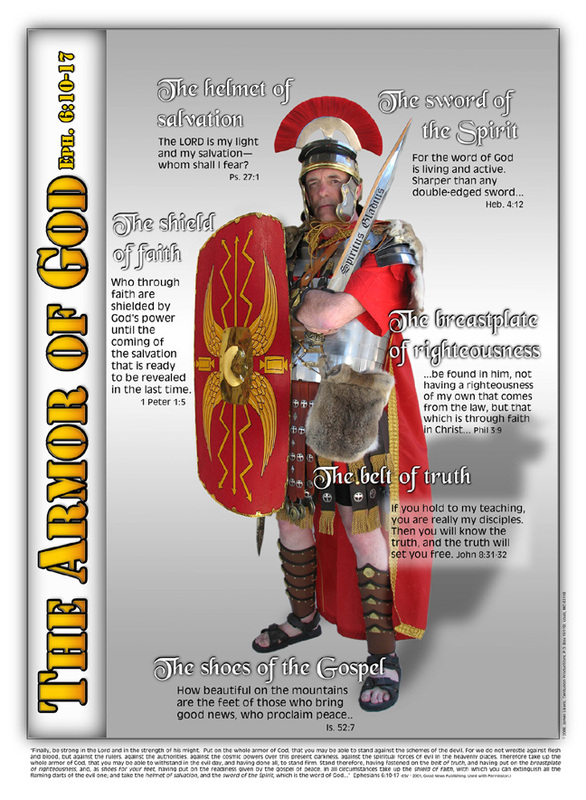 Paul maybe became interested in the armor of a Roman foot soldier. Paul may have asked about his guard’s panoply. of God, The armor of God does not come from Rome, but the Lord. 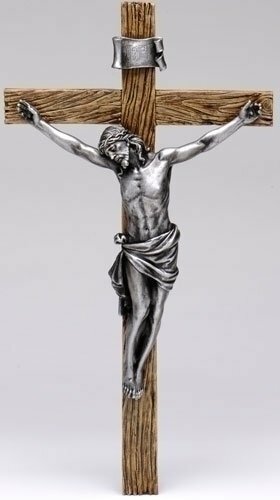 This is the standard issue of every Christians. that you may be able to stand against the schemes (Gk: μεθοδείας: schemes, wiles, cunning) of the devil. What are the devil’s schemes? Temptation: He is the tempter. By his tricks, his schemes he desires the fall of the Christian by working on the Christian’s Adamic desires “to be like God” (Genesis 3: 1ff) and from that his desires/lusts for more and more. Accusation: he accuses the brothers night and day. (Revelation 12:10) These are spiritual temptations. It is the devil who whispers, Be a better Christian, You’re not you know. Luther would retort: Tell me something I don’t know, Satan. But I have Christ as my Savior and to Him I shall flee! “…the struggle is not physical but supernatural. It is a spiritual battle against spiritual “Mafia.” The “Wrestling” in the Greek can also have the more general idea of “conflict, struggle.”‘ …it occurs only here in the NT. With regard to its usage in this text, if Paul meant “battle, conflict” in conjunction with armor… “wrestling” … was used to indicate that the fully armored soldier was an accomplished wrestler who on occasion would be involved in close-quarter struggle against a cunning opponent.’ Due to the cunning schemes of the devil, believers need to be ready for both remote and close-at-hand assaults. (This is) a face-to-face encounter. The context determines whether it is friendly or hostile. 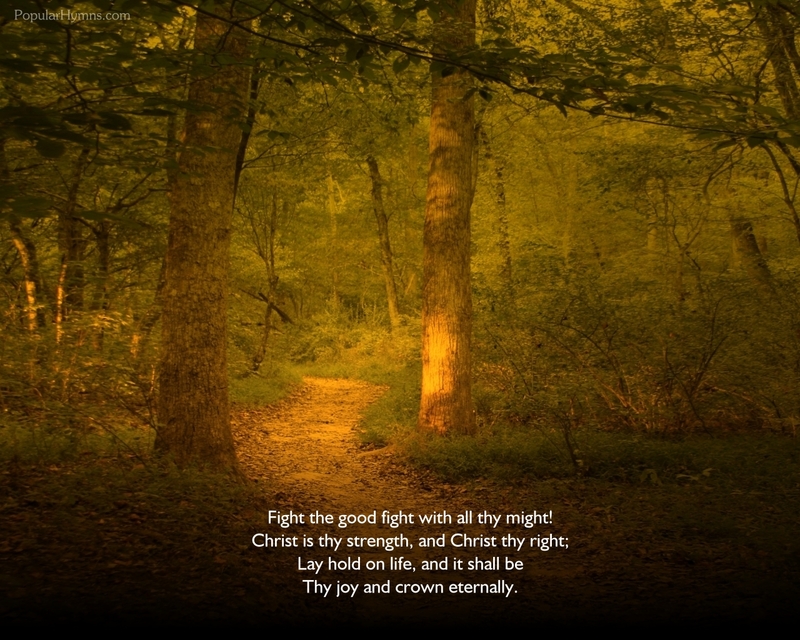 In this context, it is a hostile conflict that is not directed toward or against …. “blood and flesh.” In other words, it is not a physical struggle or a wrestling match.’ In fact, nowhere in this passage is there any indication of a human struggle. Although throughout the paragraph the second person plural is addressed, here the personal pronoun …is the first person plural, which indicates Paul’s identification with the Ephesian believers in the spiritual conflict. It is a dative of reference (“the struggle with reference to us”) though it is translated as a possessive (“our struggle”). against flesh and blood, but against the rulers, against the authorities, against the cosmic powers over this present darkness, against the spiritual forces of evil in the heavenly places. The Roman soldier’s belt would have the scabbard for his sword. God’s truth holds the Word of God, the Sword of the Spirit. Generally speaking, in Palestine and the Roman Empire, a belt was used to hold up the robes so that one would not trip on the robe! Falsehood causes us to trip up and we fall. Truth, God’s truth made flesh in Jesus, girds our loins, holds up the hem of our garment, that we walk in the way of the Lord. God’s truth is written literally in the Bible, in His Word and Life in Israel and the Church. So girded, encircled by God’s truth, will not be comfortable but for His truth we are thankful we do not fall down. When we do, He will pick us up in His body, His militia Christi, the Church. That random quote speaks to the Lord’s belt of truth. His truth will stabilize us, so that we are not, “…tossed to and from by the waves and carried about by every wind of doctrine, by human cunning, by craftiness in deceitful schemes”(Eph. 4: 14). It stabilizes the backbone. A Roman Catholic theologian, Hans urs Von Balthassar, said that the Roman Catholic Church is accused of being “rigid”. He pointed out that the Church is the Body of Christ and like a body has a backbone. We are not called to be jellyfish! The Church has a backbone, he went on to say, to bend and serve the world in His mercy. May the whole Christian Church on earth be accused of being rigid! There are exercises in working out to develop the body’s core. His truth protects and works the core, the body’s core, the body of Christ, through His Word of Law and Gospel, so that we may serve the saving Word to others as we have been so girded. No arrows can harm you With faith as your shield. 33 With many such parables he spoke the word to them, as they were able to hear it.34 He did not speak to them without a parable, but privately to his own disciples he explained everything. The only way to get seed into the earth is to spread it. At the time of Christ, planting was broadcast seeding: casting the seed prolifically upon the ground. At the time there were no massive sprinkling systems, it was rain to water the ground. Then the farmer goes to sleep. In one sense, Jesus is the Sower bar none. He took a handful of disciples, sowers, fishermen and cast them out upon the earth. They did not carry much in their bags slung over their shoulders, but the Word and Words of God and by that Word, life was given to the dead, friendship to enemies of God, light in the darkness and the darkness has not overcome it. They sowed the Gospel of the Reign of God in Jesus Christ. An important aside coming from today’s Gospel, as we are told about the farmer, “…sleeps and rises night and day, and the seed sprouts and grows; he knows not how.” Except now we know a whole more on the how. We know what is in a seed and it is amazing! 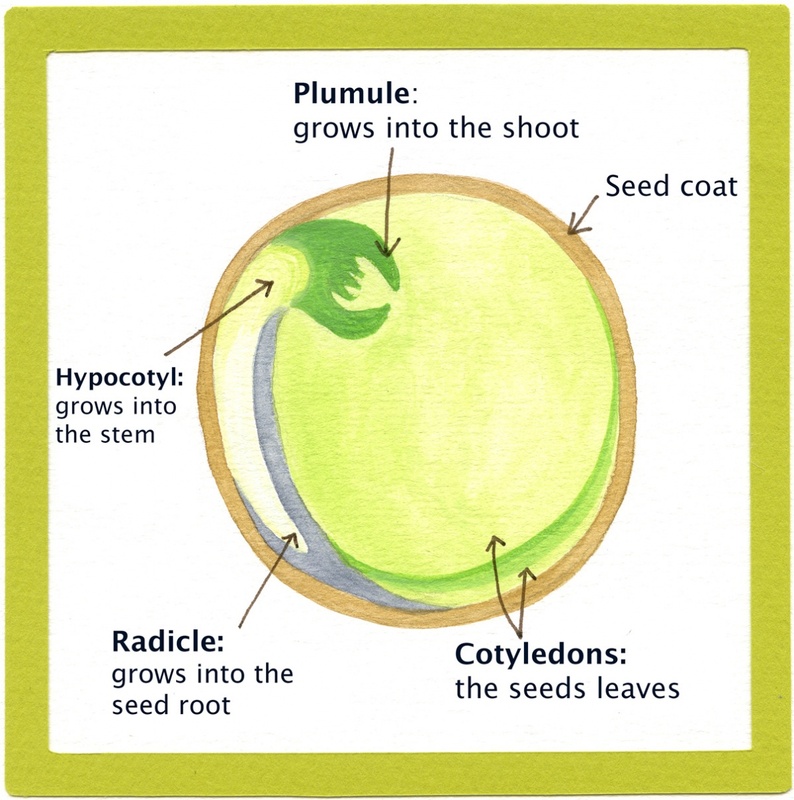 Water, sun and time maybe are all triggers to begin the germination process with all sorts of reactions occurring in the seed. Yet, the Lord in saying that the farmer “knows not how”, is not a statement of ignorance, but of wonder. My Grandfather, a farmer one day said to me when I was a child, “Every year I plant my crops and ever year I am still surprised something comes up!” With an 8th grade education Grandpa probably knew the “how” of germination, after all he first taught me about the last ice age in Minnesota that created the coal black, humus rich soil of Minnesota, but he was still amazed at germination. Science does not explain the Creator away, but can increase the wonder and joy of what we take for granted as the Creator designed it all down to the DNA. “Man shall not perish for lack of information but appreciation”, wrote Rabbi Abraham Heschel. Those seemingly inert, dead seeds come to life. We think an atomic bomb is so powerful and it is and it is horrific and yes, one of them can change the earth and we marvel at this work of men’s hands, but just think of the power in a seed, good seed. Seeds change the earth every year, “While the earth remaineth, seedtime and harvest, and cold and heat, and summer and winter, and day and night shall not cease” , as the Lord promised after the Deluge. We do not need to sweat “climate change” but neither do we intentionally treat the Lord’s gift of the planet as a garbage can. Many Christians are saying that in these United States with the tide turning against the Church, we may have to retreat into our own Christian ghettos. Maybe…but looking at the Gospel reading for this coming Sunday, I do not think we are suppose to only hunker down. “The sower went out to sow…” “…a farmer scatters seed upon the earth…” (Mark 4). The seed is the Word (Mark 4: 14). Yes, the times are rough…but just consider those 12 Apostles going into the Roman Empire, not exactly receptive politically or spiritually to Word of the Kingdom! Jesus sent out the 12 and excep John, all were brutally martyred and the Word spread, as a seed, insignificant to the world, yet it changed the world, people, like a mustard seed, “…when it is sown it grows up and becomes larger than all the garden plants and puts out large branches, so that the birds of the air can make nests in its shade.” With a lot of strange birds in it like Catholics and Lutherans, Baptists and Evangelicals and Orthodox! “Even a seven year old child knows what the Church is: namely, holy believers, lambs who hear the voice of their Shepherd.” (The Lutheran Confessions). Now a nation may choose a ghetto for us in order to keep the Church contained, but I do not think we should ever choose our own ghettos, the Lord does not want us to. In today’s Old Testament, the prophet Ezekiel has a similar parable to Jesus’ about a sprig planted in Israel which becomes “a noble cedar” also for all the birds of the air to nest in. This parable is preceded by two similar parables. The first one a sprig is taken by a great eagle from the land and planted in “… a land of trade and set it in a city of merchants”, that is Babylon. Israel was carried off by the great eagle, Nebuchanezar of Babylon. Second parable, a seed was planted in Israel from Israel in order to grow and flourish. This was Zedekiah, a son of David, planted by the Babylonian king. Zedekiah would have flourished but the Lord said he despised his and the Lord’s covenant as Zedekiah made a deal with Pharaoh and Egypt for his armies to protect Judah. It did not turn out well at all for Zedekiah and Judah. Pharaoh gave tepid support and Zedekiah would die in Babylon. Then today’s third parable points to the Messiah, the Christ, growing so that “birds of every sort will nest”. We cannot trust power politics to save the day any longer. We were never suppose to. We must speak the Word, live the Word, pray the Word, love the Lord and serve and love our neighbors. …which the ignorant and unstable twist to their own destruction, as they do the other Scriptures. 17 You therefore, beloved, knowing this beforehand, take care that you are not carried away with the error of lawless people and lose your own stability. 18 But grow in the grace and knowledge of our Lord and Savior Jesus Christ. To him be the glory both now and to the day of eternity. Amen. The Epistle reading for the upcoming Sunday (Epiphany 2, 1/18/15, Year B) is 1 Corinthians 6:12-20 in which the Apostle Paul addressed the Church in Corinth regarding their sexual immorality by pointing out that their bodies are a Temple of the Holy Ghost. “…she said, “That’ll be about enough out of you,” and changed the subject. She asked them why they called each other Temple One and Temple Two and this sent them off into gales of giggles. Finally they managed to explain. Sister Perpetua, the oldest nun at the Sisters of Mercy in Mayville, had given them a lecture on what to do if a young man should—here they laughed so hard they were not able to go on without going back to the beginning—on what to do if a young man should—they put their heads in their laps—on what to do if —they finally managed to shout it out—if he should “behave in an ungentlemanly manner with them in the back of an automobile.” Sister Perpetua said they were to say, “Stop sir! I am a Temple of the Holy Ghost!” and that would put an end to it. The child sat up off the floor with a blank face. She didn’t see anything so funny in this. What was really funny was the idea of Mr. Cheatam or Alonzo Myers beauing them around. That killed her. (1) An inclination to unbelief. (2) Suddenly forgetting the love and mercy that Christ shows us. (3) A leaning to the works of the Law. (4) Wanderings and coldness in prayer. (5) Forgetting to watch for that which I have prayed for. (6) A tendency to murmur because I have no more, and yet a willingness to abuse what I have. (1) They make me abhor myself. (2) They keep me from trusting my heart. (3) They convince me of the insufficiency of all inherent righteousness. (4) They show me the necessity of flying to Jesus. (5) They press me to pray to God. (6) They show me the need I have to watch and be sober. (7) And they provoke me to look to God, through Christ, to help me and carry me through this world. Amen.